Here is a chance for a genetic gold mine. Her horns are starting to tip outward, so she will put on more ttt. 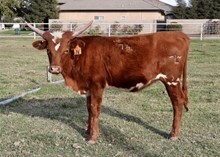 A full sister sold for $6,000 and another full sister sold for $7,750. 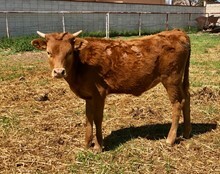 This is a young cow with a tone of horn and still growing. Heifer calf at side by California Chrome LR born 10-11-2018, and bred back for a 3 in 1 package. Free delivery within California.